Hockey can be great, and hockey can be, uh, gross. Think of how germs can spread in school classrooms, college dormitories or everyday offices. Now think of how they can spread in NHL dressing rooms, bench areas or ice rinks. These guys play in petri dishes filled with snot, spit, sweat and blood. Despite the best efforts of medical, training and equipment staffs – better manned, educated and equipped than ever before – they exchange bodily fluids easily and often. A hockey sweater might as well be a motel comforter. Every season, bugs go through teams. This season, the mumps is going around, even though vaccines have made the disease rare in North America. It has swollen the face of the face of the NHL, Sidney Crosby, who looked like he had tucked a banana in his right cheek when he met with the media last week. As of Friday afternoon, 16 players, two referees and a radio intern had confirmed cases in the NHL. A coach and a player had confirmed cases in the American Hockey League. More tests were pending. — Snot: Hockey players do not use tissues in the heat of battle. They often put a finger against the side of the nose, plug one nostril and blow out the other nostril. It’s not pretty, so to speak. This has been going on for ages. Detroit Red Wings broadcaster Ken Daniels and his friends even had a name for it growing up in Toronto, “The Pete Mahovlich,” because they saw Pete Mahovlich doing it so often on TV back in the day. — Spit: Hockey players spit. Why? It’s not like they’re baseball players chewing tobacco, at least not on the bench or on the ice. It might be because saliva builds up because of their mouthguards, or they don’t want to swallow too much water while playing, or simply habit. As a game goes on, the floor of the bench becomes more and more of a biohazard. It’s not safe in front of the bench. Guys mindlessly drink from water bottles and spit over the wall. 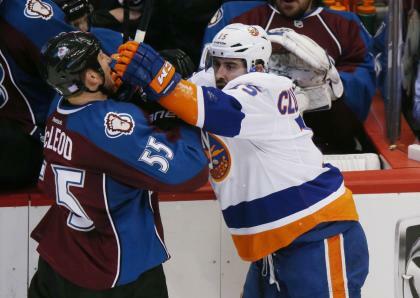 “Drive-by spitting,” Clutterbuck called it. Speaking of water bottles, some teams have water bottles for individual players – at least for individual players who are sick. But most teams fill ’em up and put ’em out, and guys just grab and go. Even if the teams wash them between practices and games, guys are swapping spit during practices and games. “I’ve always believed that’s gross,” said Red Wings forward Dan Cleary. “Do you have your own then?” he was asked. Oh. Then there’s fighting. Red Wings defenseman Brendan Smith cut his hand on a tooth when he punched Columbus Blue Jackets forward Nick Foligno last month. He needed surgery to clean out an infection and antibiotics. Red Wings forward Justin Abdelkader had a finger bitten in a fight in a preseason game a couple of years ago. (He won’t say by whom.) The bite broke the skin. He needed surgery to clean out an infection and antibiotics. “That was obviously disgusting,” Abdelkader said. — Sweat: Hockey players exchange sweat when they hit each other, lean on each other and wrestle with each other. They use sweat as a weapon. They call it, ironically, a “face wash” – rubbing a glove in another man’s mug. Hockey players exchange sweat even when they’re trying to wipe it off. Trainers try to rotate towels and keep them fresh, but it can be futile. Players come to the bench. They grab a towel. They use it on themselves. They hand it to the next guy. He uses it on himself. — Blood: Hockey players bleed. They get cut, go for stitches and get back in the game. They lose teeth, see the dentist and get back in the game. Sometimes they’re still leaking blood when they return. Sometimes things get overlooked. Once, Islanders defenseman Johnny Boychuk came back to the bench and grabbed a towel. He wasn’t paying attention to the towel because he was paying attention to the game, so he didn’t see what was on it. Too late. He had already wiped his face. The NHL has issued two memos on the mumps – a general one in November, a detailed one this week. Teams have offered vaccines and boosters to players and staff members. They have sanitized every surface they can sanitize, when they already sanitize every surface they can sanitize. Teams have hand sanitizers everywhere. Some have workers wear latex gloves to do the laundry. The Red Wings, for example, have a cleaning company disinfect everything before every season at Joe Louis Arena – their dressing room, the visitors’ room, the officials’ room, the benches. They have the company come back if they run into a nasty bug. Though they have not had anyone come down with the mumps, they have scheduled another cleaning for Dec. 26, while the NHL is on holiday break. Red Wings equipment manager Paul Boyer also has ordered the Fresh Gear ActivO, a portable room sanitizer that generates ozone to kill mold, viruses and bacteria. The company website says it’s designed for “restoration professionals performing indoor fire and flood deodorization.” It says it’s ideal for “treating homes and buildings with fire damage.” He will use it in the dressing room after a normal day of hockey.